Novocastrian Steven Slappendel produced a stellar opening 8-under-par, 64 during the first round of the Keperra Bowl. Queensland’s Marika Batibasaga sits just one stroke back on 65. As anticipated the opening round was highlighted with low scores with twenty seven players bettering the par 72 Keperra layout. Last week’s winner of the Queensland Amateur, Jake Higginbottom, opened with a 67 alongside Daniel Bringolf, and both players sit in a tie for third position, three strokes behind Slappendel. At the recent Golf SA Amateur Classic, Bringolf challenged Brett Drewitt during the closing stages of the tournament and is yet to secure a National Selection event title. 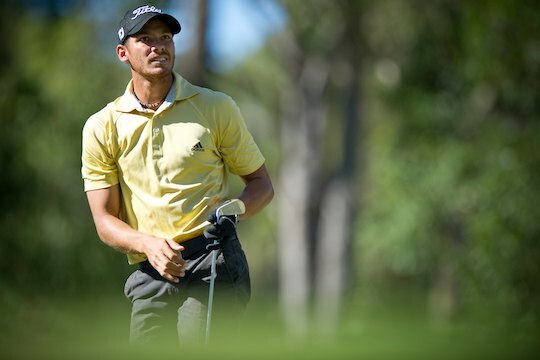 With top-10 finishes at the Riversdale Cup and the Mandurah Easter Open, Bringolf, who plays out of The Australian Golf Club in Sydney, is a real challenger for this title. Higginbottom should also not be discounted and following his opening round was general pleased with his play at Keperra. “Keperra is not an overly long course so you can post a score,” said Higginbottom. Brett Drewitt is also more than comfortable around the over 6000m Keperra layout. “There’s a low score to be had for sure out there,” says Drewitt after opening with a 68 to be in a tie for 5th position with Queensland Amateur Stroke Medalist, Daniel McGraw. Drewitt estimates between 11 to 14 under-par will take out this year’s title. “You know playing this tournament that four rounds in the mid 60’s will win,” says Drewitt ranked 36th in the world. Last year Gavin Fairfax fired an opening 8-under-par, 64, to have a one stroke lead over Cameron Smith. Fairfax then went onto record rounds of 70-63-68 to finish at 23-under-par, four strokes ahead of Jin Jeong for a wire to wire victory and to add his name to the trophy alongside some illustrious company that includes Wayne Perske (1996), Bronson La’Cassie (2004), Marc Leishman (2005), Andrew Tampion (2006), Andrew Dodt (2007) and Matt Griffin (2008). Fairfax has not returned to defend his title, while Australian Amateur Stroke and Boy’s champion, Cameron Smith, opened with a 2-over-par,74, to be in a tie for 34th position. Ryan McCarthy has made a welcome return to the amateur circuit this week at Keperra following an extended absence due to a surfing accident during the Lake Macquarie Amateur in January that forced our former number one ranked world amateur to undergo survey for a dislocated shoulder. Last August, McCarthy secured a top-16 finish at the US Amateur Championship at Chambers Bay and numerous top-20 finishes in top US amateur events during the 2010 season, including strong results at the Porter Cup, Southern Amateur and Dogwood Invitational. It’s pleasing to see the Tasmanian native return to the game as McCarthy prepares for another US and UK tour starting next month and it will be interesting to follow his progress this week. Matt Stieger, winner of the Australian Amateur title opened with a 1-under-par, 71, to be in 22nd position whilst Nathan Holman, winner at the recent Riversdale Cup, is a stroke behind Stieger in a tie for 28th position along with Lincoln Tighe, Jordan Zunic and McCarthy.